The ranking Table sorted by score with the number of won matches, ties and lost matches, you can also add to the start button your favourite football Team to fastly access data. 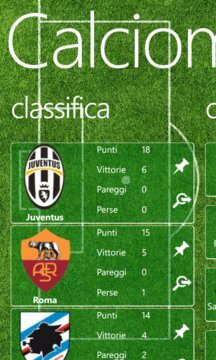 The Football Matches Calendar divided into match days with date and name of the Stadium, during the match you will have the chance to follow the noteworthy moments (goals, red and yellow card and substitutions). The results of the matches detailed with the highlights of the individual matches (goals, red and yellow card and substitutions). During the match you can activate the timer in order to automatically update data. General news available in Italian language only. Please remember that you will be able to add to the Start Menu the OWN app of every SINGLE Football Team. The Calendar of the single Football Team includes all the Campionships. 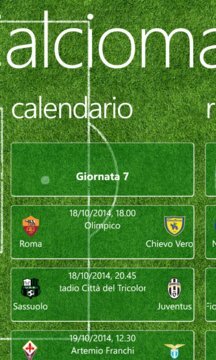 In the Serie A Calendar for the current week, the possible match lineup will be displayed. Do not hesitate to contact me if you wish to implement any new feature and please do not forget to vote with five stars this app within the Store. May the best Football Team win!